The 11-story apartment building is being built on East 126th Street. HARLEM — The developer of a 233-unit mixed-use apartment building in East Harlem broke ground at the site Wednesday. Blumenfeld Development Group is building an 11-story apartment building on East 126th Street, between Lexington and 3rd avenues. The building will have 232,000 square feet of space and 43 of the units — including studios, one and two-bedrooms — will be affordable under the mandatory inclusionary housing program. The first two floors, roughly 34,000 square feet, will be devoted to commercial space. The company’s portfolio mainly includes office space and big-box retail units. The company is the developer of the nearby Gotham Plaza on East 125th Street and the East River Plaza on East 117th Street, which is home to Target and Costco. “We said at some point we were going to build residential (property) and that day has come,” said David Blumenfeld, the company’s vice president. 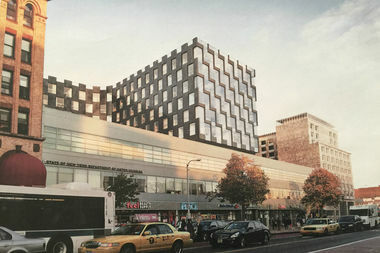 Renderings of the building show its front façade slightly bending inward and part of the building peaking over the roof of Gotham Plaza. The designer, Bjarke Ingels, said the inside of the building will represent the Caribbean culture of the neighborhood with an “explosion of color,” different from the black stained exterior.